Astrid Lindgren’s works and especially her cooperation with photographer Anna Riwkin-Brick has received special attention at the children’s film festival Cinematheque in Tel Aviv, which is going on 18-24 July. This popular festival, organized for the ninth time, is this year focusing on films that have been adapted from children’s books. 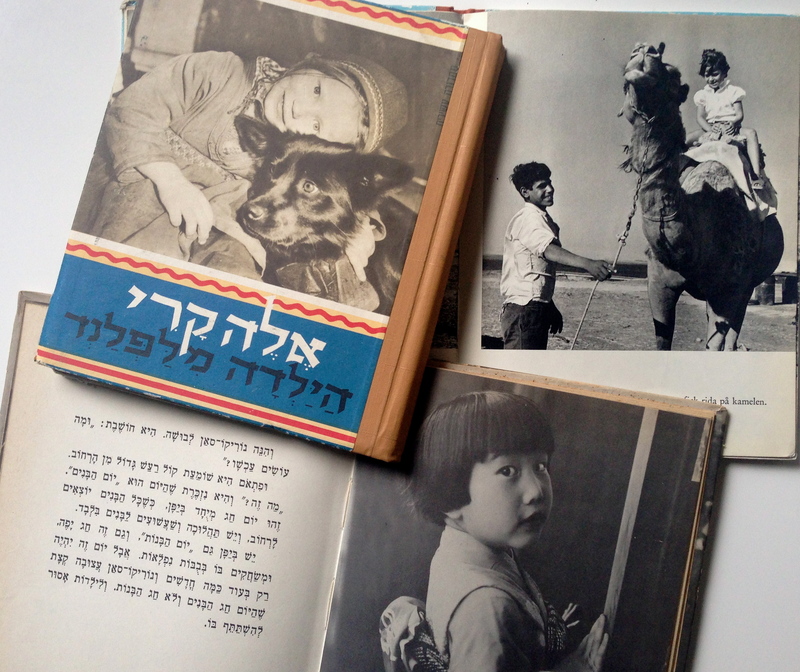 The Lindgren’s and Riwkin-Bricks’ books are treasured and have classic status in Israel and the books are still read today. In addition to film screenings, other events were organized surrounding these books, including the library Beit Ariela, which last Friday held a well-attended seminar with Palestinian researcher Abed El-Salam, author Tamar Verta and myself, and the Israeli researcher Hanna Livnat. Furthermore, a reading marathon for the younger audience was arranged under the theme of Astrid Lindgren’s Ronia the Robber’s daughter. Other events at the festival were a panel discussion between documentary filmmaker Dvorit Shargal, journalist Kobi Meidan and myself. Shargal is working on a documentary about the children of Lindgren’s and Riwkin-Bricks’ books. In particular, the focus was Riwkin-Bricks and Elly Jannes iconic photo picture Elle-Kari came out in 1952. The auditorium was crowded, and a funny surprise was that the protagonists from the book Eli live in Israel (from 1964), aged five at the time when the book was written, appeared on stage – now almost fifty years later! Link to festival’s web here. I was her reader as a kid and it turned out that I became a filmmaker as an adult. For me this film is a special homage to Lygia Bojunga’s work, so important to many generations of young Brazilians. 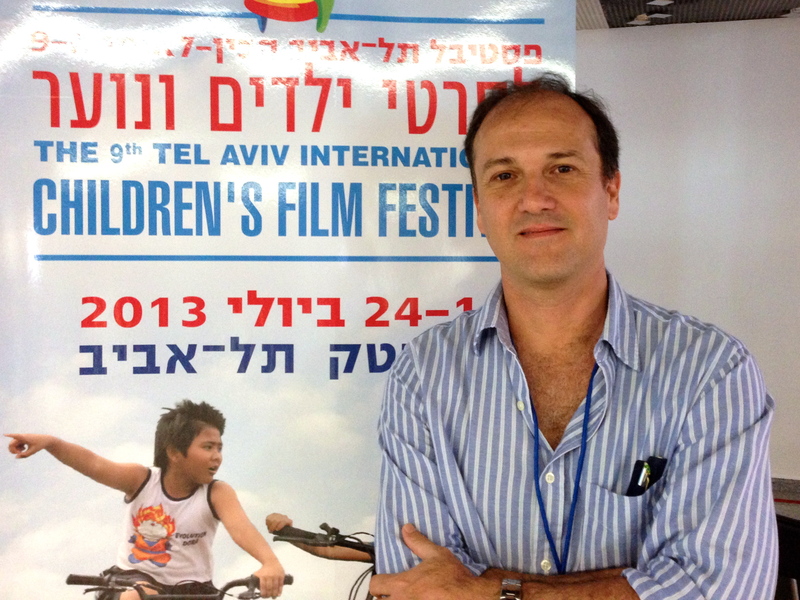 Eyal Feder at the Garden Library in Tel Aviv and Elina. 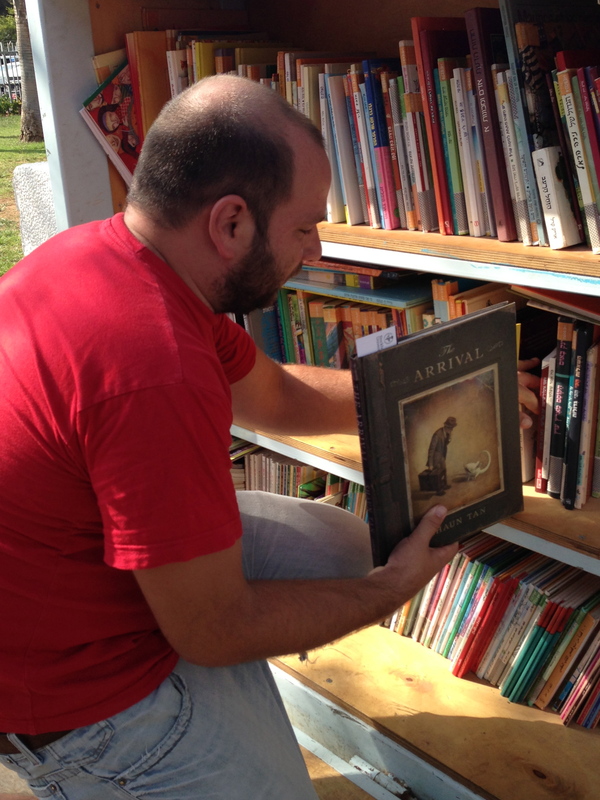 During my stay I also visited the Garden Library, a reading promotion organisation in the southern parts of Tel Aviv, which offers books for refugees, migrant workers and their children via a small outdoor library. 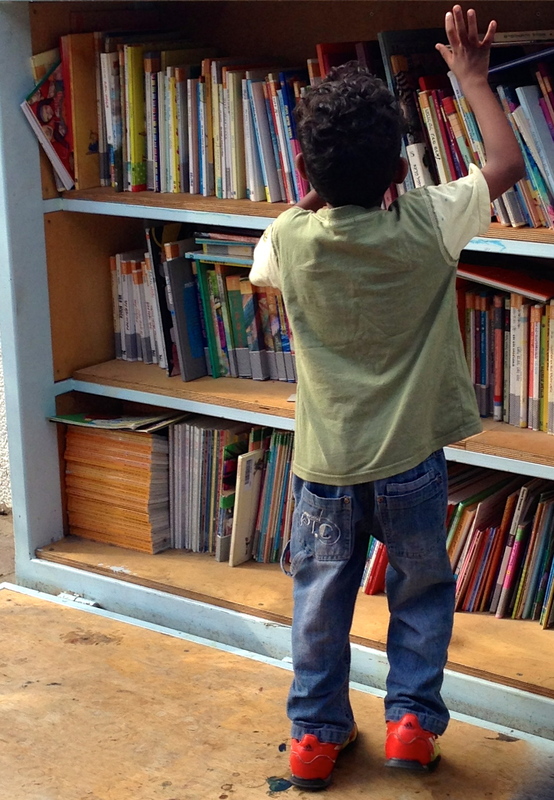 The library was founded by ARTEAM, a socially engaged art collective, and is today run by volunteers. I met Eyal Feder from the Garden Library, who told me that the library currently contains 3,500 books in languages such as Arabic, Chinese, Hindi, Bengali and Hebrew. 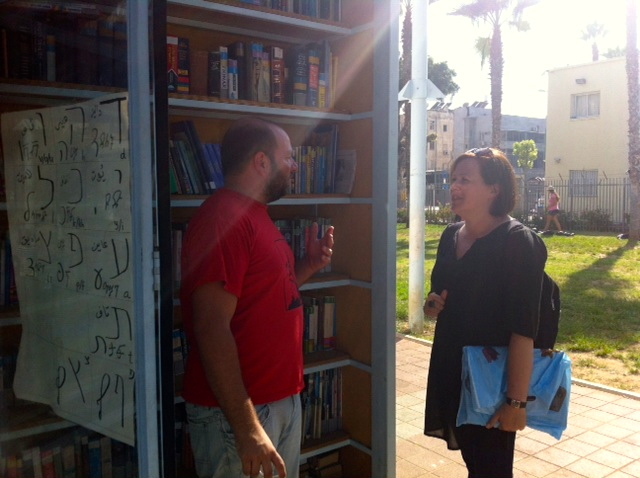 Every weekend families and children from Tel Aviv’s southern neighborhoods are gathering in Lewinsky Park to visit the library, and the organisation also arranges regular theater performances, reading and writing assistance and other activities. The library is formed by two open bookcases, which are supported by the walls of a public shelter located in the heart of the park. It has a simple roof, which provides shade and shelter. After sunset, the bookshelves are lighted up from behind, which allow reading and creates a meeting spot in the evenings. This small but remarkable library, surrounded by playing, reading and chatting children, is situated in the middle of a harsh environment but is, at the same time, a welcoming and truly inspiring meeting place for both adults and children. More about Garden Library here. 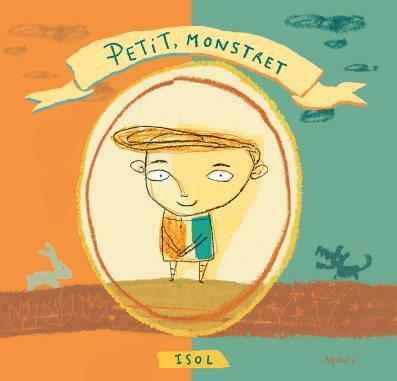 Isol isn’t only known for her picturebooks, but also for her music. Those of you who have watched her speech from the award ceremony already know that she can sing, since Isol there performed Kurt Weill’s tango Youkali. Isol sings baroque with her ensemble The Excuse, she used to be a member of the Argentinian electropop group Entre Ríos and has collaborated with the American indiepop group Alsace Lorraine on the exquisite album Dark One (2007). Together with her brother Federico Zypce, Isol also forms the duo Isol/Zypce. If the albums Isol made with Entre Ríos and Alsace Lorraine can be called pretty straight-forward pop, Isol/Zypce is something else. Their 2008 album Sima begins with the sound of a lonely, old musical box. What then follows is an exciting collage of digital and analogue sounds. Strings, sampled bagpipes, hand drums and Isol’s smooth, sometimes wordless vocals meets drum machines, electronic beeps and crackling sounds. At one moment, Isol sings to the accompaniment of only strings and the sound of rain and thunder. Isol herself has called Sima “harsh music”. That is half of the truth. It’s also enchanting sounds and the most beautiful melodies. 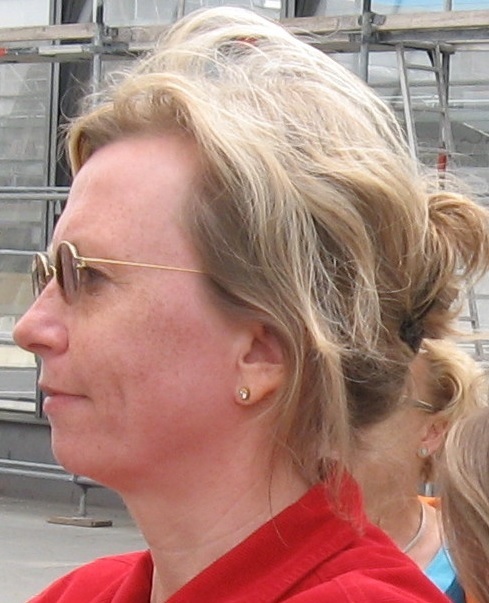 Lotta Lyssarides is publisher for Children’s books at Alfabeta Publishers in Sweden. Alfabeta has recently published Petit, the monster in Swedish, which has received much attention in the press. What are the reactions from the Swedish readers so far? We have heard that a lot of children are enthusiastic about the thought of a person being BOTH good and bad. Petit in the book is a good boy when he plays with his dog, and a bad boy when he is fussing with the doves. It is a very comforting idea that you are not entirely bad, or good. One little girl wanted to read the book on and on for days, and every day she told her parents about different friends of hers that were “bad-kind”. What do you think appeal to the readers in Isol’s books? The books have a good sense of humour and Isol likes to challenge and surprise her readers, which is appealing. The characters are often a bit anarchistic and different. The books seem to be quite ”easy” but underneath the surface there is always something more to explore. I know that many children are inspired by her pictures, her use of colours and lines. Next book to be published in Swedish will be It´s useful to have a duck. When will it be available in the stores? In the end of September (2013). It is a “leporello” – a book you can fold out. One side has a boys perspective: It is useful to have a duck. The other the ducks perspective: It is useful to have a boy… Mind bending and fun. Do you plan to publish any other book by Isol? Oh, yes! Next book is Nocturne, the very inventive glow-in-the-dark bed time book. I know that you´re soon off for summer holidays. What books will you bring to the hammock? During spring and autumn there is not much time to reading novels that are already published, so I am really looking forward to that! This summer I’ll start off with Den bästa dagen är en dag av törst by Jessica Kolterjahn, Kaddish på motorcykel av Leif Zern and Främling på tåg (Stranger on a Train) by Jenny Diski.